In the marriages of friends (or divorces of some), I’ve watched expectations that can only be fulfilled by God’s perfect love destroy what is there. The grass is not greener for my married friends—it’s just different grass. I may feel longing in wanting a companion to share things with or children to raise to love God. I may feel loneliness or feel forgotten. This is the burden I carry as a single woman. But this is one side of a coin. On the other side, my married sisters also experience loneliness or feel forgotten within the bounds of their marriage. They have been blessed with husbands and children, yes, but that season carries it’s own hurts and burdens. They daily hurt and are hurt by their best friend and are constantly trying to extend grace and accept forgiveness and maintain love for that person despite this. Their desires are thwarted by helpless babies and willful toddlers that know no better than selfishness. These are not the challenges of my world, but they are in fact challenges that I must remember to hold compassion for. Just because those in other seasons have blessings we do not, it does not mean we can ignore the burdens we are meant to carry for one another. It’s easy to forget the chaos others experience when we are consumed with our own. In my own life, chaos can look like a lot of worry and a lot of anger. If God does not provide a partner for me, then will my life be valuable? Will I find community as my married friends fulfill their search for couple friends, for kids, for friends with kids, etc? What happens when my parents have passed on? What happens when I am old and my health declines and I do not have my own children to care for me? On and on it goes in the neurotic mind of this late-twenty something. I can become angry that I have devoted myself to God and his word and he has not provided the desires of my heart. I come to Him as a consumer rather than a worshiper and of course find dissonance where I expected I would get my way. In the elevation of romantic or sexual love over the love of God in a church community, chaos can reign supreme. Couples and families are served—as they should be—but often this elevation of the nuclear family leaves the single, divorced, or widowed out of the community wondering if there is even a place for them. We do not look outside those of our own demographic to bring them into our homes, around our tables, or into our hearts because we do not see them. But the gospel—and ergo the church universal—does not exclude anyone. The body of Christ is so much the better when we embrace those different from our situation in life because we are united in Christ. Families who have done this for me have provided the connection and stability I crave that is often absent when I am on my own. In turn, I am able to give another voice for their children, another walk with Christ to observe. I am able to challenge norms and bring a passion that has been lost in the shuffle of getting everyone between school, small groups, and sports practices. I have received many a glimpse of singles who want to hold anger and point a finger at how the church has “forgotten” them. (I have been so guilty of this myself). It can be hurtful. It can be isolating. It takes a lot of risk to find a place in a community made for nuclear families made up of both husband and wife when you are outside of that. So here is the ultimate question—the question not just in this type of chaos, but in all chaos: What is the telos here? What is the ultimate goal? Is it to consume the love of man that I so often demand? To expect my relationships to fulfill me regardless of what I might or might not pour into them? Or is it to receive and extend the love of God? To live into and out of my kingdom identity? The truth of Galatians is so clear here: “There is neither Jew nor Greek, there is neither slave nor free, there is no male and female, for you are all one in Christ Jesus.” We are people in need of God’s love and made to extend that toward one another: wives to husbands, husbands to wives, Christian brothers and sisters towards one another regardless of marital relationship, financial status, or season in life. So I can rest in the love of God knowing he is a God who provides—if not a husband, then a community of believers—a God who sees—my longings, hurts, and weaknesses and loves me anyway—and a God who wants me to value him over all else—and patiently pursues my heart in this with tenderness. I was not created to consume, but created to love. He values my holiness over my happiness and it is in pursuing holiness that I find myself whole. And this may not result in a husband. But it will result in a deeper knowledge and love of my father—a fulfillment of my purpose. Mostly, I notice my brokenness in all of this complaining and discontent. A cycle of frustration and guilt, frustration and guilt, frustration and guilt has marked my days and I have had trouble reconciling the tension. So many prayers asking for contentment, or better attitudes, or anything to resolve the itchy, too-tight feeling I feel in my faith communities. Because, let’s be honest, I am the common denominator in these spheres. It wasn’t until listening to two friends talk through one’s frustrating family situation that I began to find some hope. “I’m just becoming so aware of my brokenness in all of this,” my one friend said, a little teary. I almost started sobbing right there. Because I felt this—I hadn’t known it before that moment, but this was what I had been aching for. God loves us so much that he has covered us in his own righteousness that we can come before the Father without fear. And how much more does he loves us that he takes us just as we are, but also steps in to heal our broken places. He is not looking for me to heal my broken, cranky places. Of that, I am incapable. He is making me more aware of them so that I bring them to him. To sit with him, seeking more of him. To behold over behave. My purpose is not to fix the church. That is for God to do. I am part of the church—a very broken part at that. My purpose is to sit and let him work on me, surrendering how I think things should be—how I think I should be. To let him sing over me in grace so that I may walk out into the world with that same grace to give. He confronts us with our brokenness not to shame us into submission. He wades into our broken places to demonstrate his grace and sing over us with love. It’s through grace and love that our broken places are made whole. One of the pleasures of seeking contentment in the season I’m in has been pursuing a romantic life over a life filled with romance. What does that even mean? Great question! My evenings are not filled with dates very often, but that does not mean that I need to wait to experience beautiful and exciting things—a thought-trap I think we can fall into when waiting for romantic love. That’s a lie! Why wait to experience the beauty life has to offer until one is in a relationship? I cannot tell you the joy I have found in visiting the local botanical gardens with just myself and a journal, in planning vacations with dear friends, in sitting in my favorite hotel lobby with a good book and cup of tea. I live in a city that begs to be explored and while some of that exploration would be fun to do as a date night, why should I miss out when I find myself alone? Why should any of us. Pursuing a romantic life means making time for the things that bring me pleasure. It means stopping to enjoy created beauty. It’s exploring the small things that make up a life that might otherwise go unnoticed. Traveling Europe alongside close friends. Spending an evening in with nothing to do but drink a cup of tea and listen to the poetry of a new record. Taking myself on a coffee date. Doing nothing but read for an entire weekend. Bringing a journal to the local botanical gardens for a morning of prayer and reflection. Driving hours just to go to see my favorite band play in concert. Wearing heels and the brightest red lipstick I can find because it makes me feel like an old Hollywood actress. Making last minute plans with a friend to talk about the real stuff over wine. And it’s not just enjoying what I know I like, but pushing myself to experience the new and different, and maybe slightly uncomfortable. I have plans to take myself out to dinner. I’m starting to dream up a trip to take by myself. Living a romantic life is participating, not in the life you dreamed of, but the pretty-damn-beautiful life you’ve been gifted. It’s taking note of the glorious and grand in the midst of the minute and mundane. This has been my adventure and I want to hear about yours. How are you pursuing a romantic life? I was recently reminded of a blog post that posed the question, “What’s saving your life right now?” The lovely Anne Bogel talked about how we so easily can get caught up in that situation or feeling that is “killing us”, but how often do we recount the things that are saving us? This was a great concept to think on as I find myself in a mid-season slump—the newness of summer has worn off, everything I look forward to is too distantly in the future to do anything about, and things have just slowed down. It’s not a bad season. It’s one that’s calling me to faithfulness and reordering. I love summer—the slower pace, the great weather, all the opportunities to enjoy my people and my city. But so often, I forget about these things and instead get caught up in busy-ness, producing, and just plain discontent. I spend my time paying attention to that which is burdensome and ignore the daily graces that abound. My July is a little slower than my June and August and it’s been a great chance to tackle my ever-growing to-be-read list. I’ve had a great time digging into Blake Crouch’s Dark Matter and Jamie Smith’s You Are What You Love. Next up? I’m breaking into my first Steven King novel—it’s so about time. It’s no secret I have a tea problem. In attempting to carve out space for liturgy and good habits in my daily life. Starting the day with tea forces me to slow down my morning. It also gives me motivation to get up with the alarm rather than pressing snooze for the fifth-time. Taking the time to make the tea and then enjoy the tea helps give shape and perspective for the rest of the day. It’s a little reminder to take a moment and acknowledge the one who made the tea leaves and the morning and think on who my day belongs to. I’m getting better a making time for my writing during a given week. I’m not great at it, but better counts for something! I’ve been so refreshed and challenged by the editing process and it’s been really satisfying. I think any creative outlet for even the smallest amount of time brings the refreshment one needs in a hum-drum season. It’s life-giving. Just click here. Happy music makes for happy summers. Tsh Oxenreider has been hosting a great series on her podcast, The Simple Show. “Women’s Work” is a series exploring the work of artists, entrepreneurs and other great women who are doing what they love in a creative manner. I have learned so much as a storyteller and professional and it’s only half-way through the series. Worth the listen! One of my favorite things about summer is all the fresh things you can buy so easily from local sources! Cherries have been great this year and we’ve done so much with strawberries in our house—it’s been great! Over the weekend, I made a salad topped with peaches and goat cheese—definitely a new favorite. What daily graces are you dwelling on right now? I’d love to hear about them in the comments! Being honest here. Being embarrassingly, shamefully honest: I expect a lot out of a new article of clothing. There is a small part of my mind that thinks (and I wish I was not telling the truth here!) 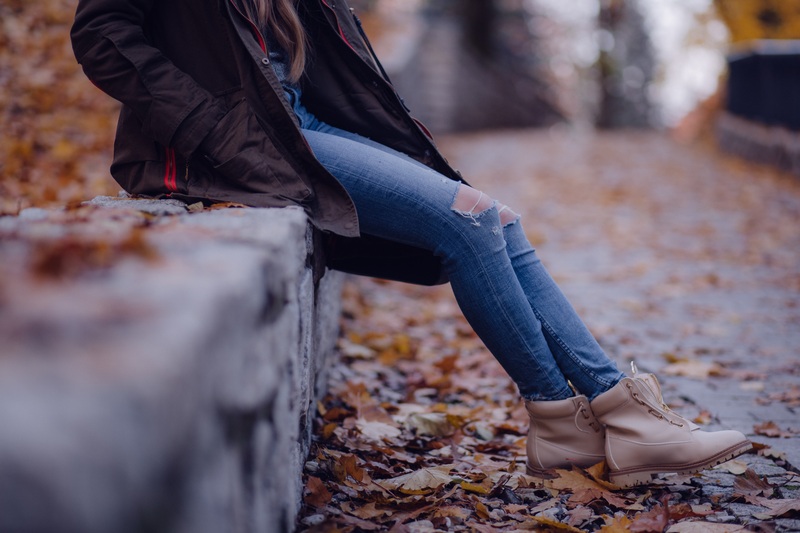 that maybe with the right jeans, or dress, or shoes, maybe everything will finally be okay. Maybe with that new pencil skirt, I’ll find professional fulfillment. Maybe with the right cut of jeans, he’ll ask me out. Maybe the perfect heels will actually satisfy. And I know I’ve discussed this a little before, but just because I wrote about it doesn’t mean I solved it. Here’s what I know: the lies we believe manifest themselves differently in different stages of life. I may feel more secure in my appearance, but there were other insecurities that were able to take a front seat in its place as soon as that began to vacate. My good friend Bruce was right on when he sang that we all have a hungry heart. We all have that thing. Yours may not be clothes. Yours may be attention, or food, or relationships, or travel. We all have something in our lives that we are trying to make satisfy that aching place. Folding my laundry this week, I looked at the tangle of warm jeans and had to shake my head. This was just fabric. It is incapable of doing anything but covering my body. It provides nothing but warmth. Nothing on this earth is meant to satisfy my insecurities or desires. Nothing is going to bring the level of satisfaction I ache for. Nothing is going to assure me that I’m beautiful or worthy of love. Certainly a pair of jeans isn’t going to do any of that. We ache for so much that will never be experienced this side of heaven. We battle brokenness daily. Seasons of darkness can weigh so heavily. We were not made for here. We were not made for this insecurity and toil and pain. We were made to be satisfied and secure. To be completely fulfilled. To be happy. For everything we will not have here, we do have love. We are so completely and incredibly loved. And it is because of that love that we can experience fulfillment, security, and happiness. But only from the source—Jesus Christ. I have gone for too long feeling like food didn’t taste as good as it could, relationships were not as fulfilling as they should, conversations were not as satisfying as I wanted. Everything was falling short. And everything should be falling short. It is only when I am seeking my fulfillment in Christ that life is put in its proper place. I am able to give to my relationships and receive all that is there. I am able to be fully engaged in conversations. My work is satisfying in a proper way. My clothing takes a proper place as mere material. 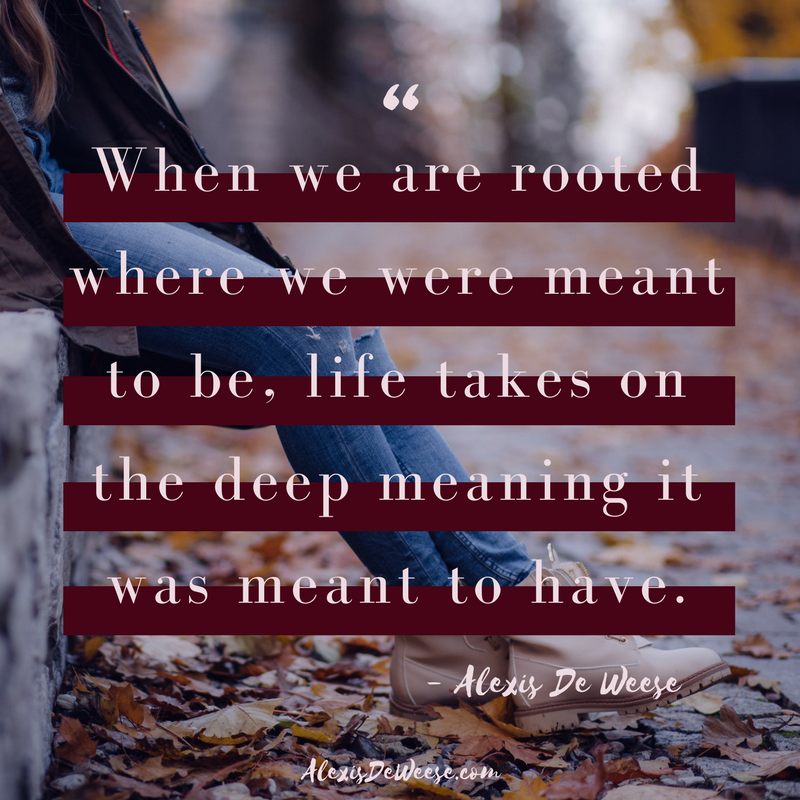 When we are rooted where we were meant to be, life takes on the deep meaning it was meant to have. We serve out of confidence and security. We give out of a pure heart and generous spirit. We love out of humility and selflessness.